Takes 15 minutes serves 4. Heat pan and saute 3/4 cup mixture of carrots, onions and celery. This can be made ahead of time. If previously made, you will not need to saute, only heat. Cut cauliflower head in half. 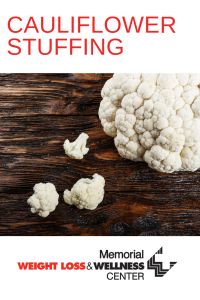 You will only need to use half of the cauliflower. Remove any leaves and cut into large pieces. Use food processor with shredding blade. Shred cauliflower and mushrooms. Add mushrooms and cauliflower to carrot mixture in pan. Cook on medium heat until the mixture resembles the look and texture of bread stuffing, about 5-10 minutes. Serve with chicken, butternut squash, roast beef or any desired protein.